Background: Clostridium botulinum causes botulism, a serious paralytic illness that results from the ingestion of a botulinum toxin. Because silver nanoparticle products exhibit strong antimicrobial activity, applications for silver nanoparticles in healthcare have expanded. 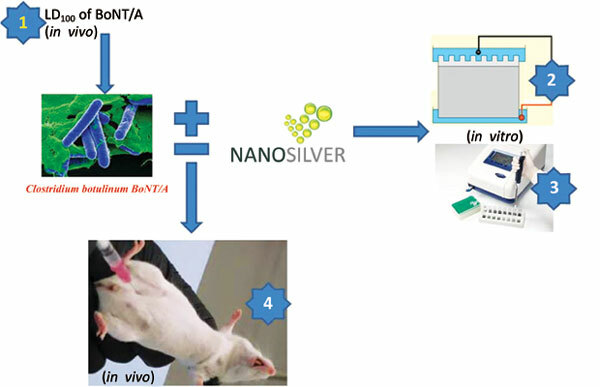 Therefore, the objective of the current study was to assess a therapeutic strategy for the treatment of botulism toxicity using silver nanoparticles. Methods: A preliminary test was conducted using doses that produce illness in laboratory animals to determine the absolute lethal dose (LD100) of botulinum toxin type A (BoNT/A) in mice. Next, the test animals were divided into six groups containing six mice each. Groups I, II and III were the negative control (botulinum toxin only), positive control-1 (nano-silver only) and positive control-2 (no treatment), respectively. The remaining groups were allocated to the toxin that was supplemented with three nano-silver treatments. Results: The mortality rates of mice caused by BoNT/A significantly reduced in the treatment groups with different doses and injection intervals of nano-silver when compared to the negative control group. BoNT/A toxicity induced by intraperitoneal injection of the toxin of Clostridium botulinum causes rapid death while when coupled with nano-osilver results in delayed death in mice. Conclusion: These results, while open to future improvement, represent a preliminary step towards the satisfactory control of BoNT/A with the use of silver nanoparticles for human protection against this bioterrorism threat. Further study in this area can elucidate the underlying mechanism for detoxifying BoNT/A by silver nanoparticles. Antibacterial, Clostridium botulinum, botulism, BoNT/A toxin, intoxication, nano-silver.